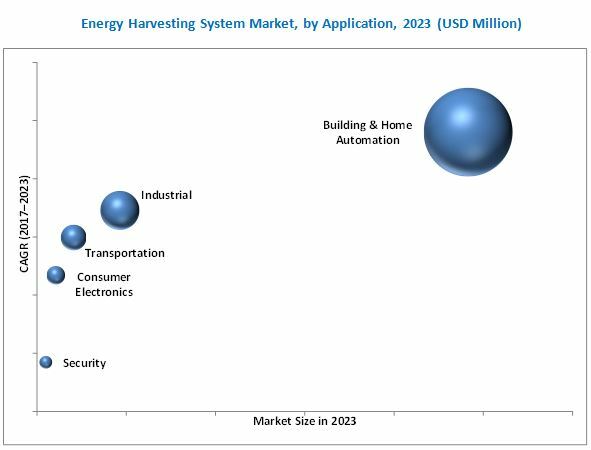 [171 Pages Report] The energy harvesting system market is expected to witness high growth during the forecast period. The overall market is expected to grow from USD 311.2 Million in 2016 to USD 645.8 Million by 2023, at a CAGR of 10.62% between 2017 and 2023. The base year considered for the study is 2016, and the forecast period provided is between 2017 and 2023. The objective of the report is to provide a detailed analysis of the market based on technology, component, application, and region; information regarding the major factors influencing the growth of the market (drivers, restraints, opportunities, and industry-specific challenges); and a detailed value chain analysis. Moreover, the objective of this report is to strategically profile the key players and competitive landscape for market players and provide information on product launches, acquisitions, partnerships, agreements, contracts, and collaborations in the energy harvesting system market. The research methodology used to estimate and forecast the size of the energy harvesting system market begins with obtaining data on key vendor revenues through secondary research. Some of the secondary sources used in this research include information from various journals and databases such as IEEE journals, Factiva, Hoover’s, and OneSource. The vendor offerings have also been taken into consideration to determine the market segmentation. The bottom-up procedure has been employed to arrive at the overall market size for energy harvesting system from the revenue of the key players. This data triangulation and market breakdown procedures have been employed to complete the overall market engineering process and arrive at the exact statistics for all segments and subsegments. The analysis of the energy harvesting system market includes extensive primary research to gather information, verify, and validate critical conclusions arrived at after an extensive secondary research. The energy harvesting system market is expected to be valued at USD 645.8 Million by 2023, growing at a CAGR of 10.62% between 2017 and 2023. The major factors driving the growth of this market include growing demand for safe, power-efficient, and durable systems that require minimum or no maintenance, extensive implementation of IoT devices in automation and energy harvesting technology in building and home automation, and increasing trend for green energy and favorable initiatives by the governments. This report segments the energy harvesting system market on the basis of technology, component, application, and region. The energy harvesting system market for the building and home automation application is expected to witness a significant growth during the forecast period. The significant growth of this industry can be attributed to the increasing installation of wireless sensor networking (WSN) which is expected to boost the energy harvesting system market through increasing self-powered sensor networking. The light energy harvesting technology accounted for the largest share of the energy harvesting system market in 2016. This growth can be attributed to its availability; solar energy is the most widely available natural resource that can be easily converted into electricity owing to which the manufacturing of solar-based products is increasing and the efficiency of photovoltaic cells is also increasing. The energy harvesting system market for transducers is expected to grow at the highest rate between 2017 and 2023. This high market growth rate can be attributed to the rapidly growing adoption of energy harvesting systems in building and home automation, industrial, and transportation applications. The Americas accounted for the largest share of the overall energy harvesting system market in 2016. This growth can be attributed to the high adoption of energy harvesting systems in the building and home automation application in the Americas and Europe compared to other regions. Standardization of communication protocols is one of the challenging factors impeding the growth of the energy harvesting system market. In the energy harvesting system, standardization of communication protocols helps companies develop devices with less analytical efforts. In wireless electronics, the communication protocol is the crucial factor that connects devices with each other. The standardized protocol is important for both components and the complete system. Various companies follow their compliance for communication; for example, devices from EnOcean follow the ISO/IEC 14543-3-1X international standard and devices from Linear Technology follow the EC6158, EDDL (IEC61804-3), and IEEE802.15.4 standards. The difference in communication protocols majorly hinders the growth of companies working in isolation, such as Linear Technology (US), or hinders the new entrants enter the market. The key players in this market are EnOcean GmbH (Germany), Powercast Corporation (US), Cymbet Corporation (US), General Electric (US), Linear Technology (US), Convergence Wireless (US), Mide Tecnhology Corporation (US), Microchip Technology Inc. (US), ABB Limited (Switzerland), Fujitsu Limited (Japan), STMicroelectronics (Switzerland), Honeywell International Inc. (US), Texas Instruments Incorporated (US), Lord Microstrain (US), and Cypress Semiconductors Corporation (US). Top 25 Companies Analyzed for This Study are - ABB, Advanced Linear Devices, Inc., Arveni, Bionic Power Inc., Convergence Wireless, Cymbet Corporation, Cypress Semiconductor Corporation, Enocean GmbH, Fujitsu, General Electric, Greenpeak Technologies, Greenteg, Honeywell International, Kinergizer Bv, Linear Technology, Lord Microstrain, Micro Gen, Microchip Technology Inc., Mide Tecnhology, O-Flexx Technologies GmbH, Piezo Systems, Inc., Powercast Corporation, Stmicroelectronics, Texas Instrument Incorporated, Voltree Power, Inc.
*Details on Business Overview, Products Offered, Strength of the Product Portfolio, Business Strategy Excellence, Recent Developments and Key Relationships Might Not Be Captured in Case of Unlisted Companies.